Being remembered for living life to the full was our brief when designing this memorial. 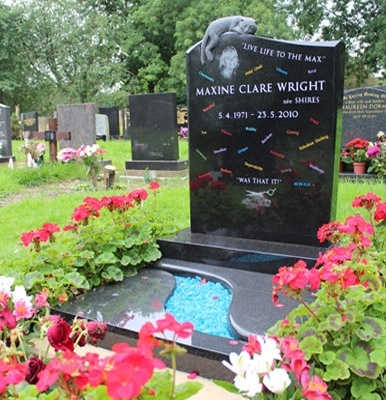 Full of vibrant colours and designs specific to her life, the memorial succeeds in reminding relatives of the happy times, hobbies and work she did. From the carved sleeping cat on the top of the memorial to the flowing lines of the kerbset, this memorial is a completely unique piece of craftmanship.